Then, you must definitely go to Berlin's city centre, to experience Berlin's charm for yourself. Whether a stroll around Potsdamer Platz, along Friedrichstrasse or Kudamm, a visit to the Reichstag or to Schloss Charlottenburg, or wandering around the many areas with restaurants and bars ... Berlin has got something to offer everyone. Potsdamer Platz in the centre of Berlin extends over 50 hectares and is an exciting quarter to be in. This ultra-modern area is made up of the so-called Daimler-City and the Sony Center. At the core of the Daimler part there is a huge, three-storey shopping centre - the Potsdamer Platz Arkaden. Distributed over 50,000 square metres you will find a very varied and attractive range on offer. There is also a large multiplex cinema and an IMAX cinema (3D and IMAX films are shown here at hourly intervals). There is also a large casino and a musical theatre, where stars can occasionally be spotted going to special events such as the Berlin Film Festival. The Sony Center, which was built opposite Daimler City is also a tourist magnet. In the core of the Sony Center there is an architecturally very interesting covered square with a fountain, several cafes, restaurants and a cinema. In the evening, Potsdamer Platz does become quite a party mile. Bars and discotheques, such as the Adagio of the well-known Felix near Brandenburger Tor, are good places to go dancing. Travelling with a "regional" train from Berlin-Spandau, it takes about 30 minutes to Friedrichstrasse, where you change and travel one stop to Potsdamer Platz. By car in the evening, you will need about the same time. Parking is only possible in the very large underground garage. Not far away from Potsdamer Platz you will find Friedrichstraße, a shopping street which previously accommodated a border crossing point at Checkpoint Charlie. Unter den Linden, Berlin's culture kilometre, is just around the corner, starting with Berlin's famous landmark, the Brandenburg Gate. "Unter den Linden" leads directly to the old centre of East Berlin, Alexanderplatz with its TV tower and the "Rote Rathaus", Berlin's "red" town hall. 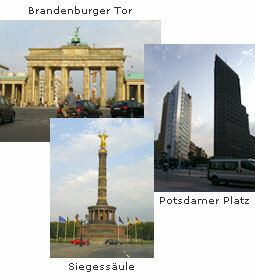 The centre of what used to be West Berlin is "Kurfürstendamm", affectionately shortened to "Kudamm". The landmarks here are the "Gedächtniskirche" (Church of Remembrance) and the Mercedes star on the roof of the "Europa-Center". Kudamm is a place to go shopping, to visit the zoo or to just lounge around in a cafe. Berlin's excellent public transport network means that it is not far from one sight to the next. Travel to & from Spandau either with the "S-Bahn" or with a "Regional" train.